Jazz journalist and musician Bill Minor helped make the first in the new lit series, Pizza & Prose, a big hit. Bill made the drive up from Monterey to Capitola, as did several CCW members, to share his fascinating personal story of how he first came to put pen to paper. With a southern mom and “Yankee” dad, Bill grew up with quite an eclectic ear for music and stories. 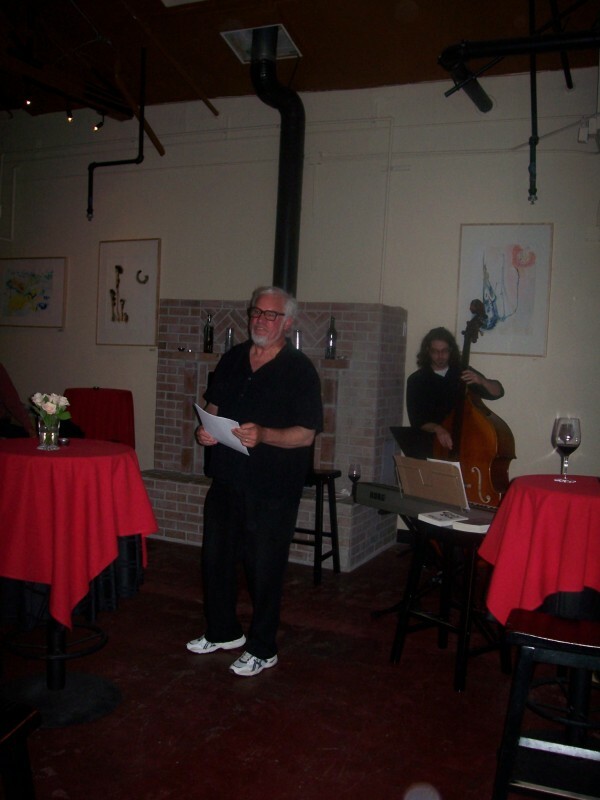 In addition to being a journalist and accomplished musician (by the age of 16) on several instruments, he is a visual artist, author, teacher, and, we learned on March 21 at Cava in Capitola, he is a screenwriter, as well. Bill also serves as area expert on contract negotiations for the local chapter of the National Writer’s Union . His road from the south, through Brooklyn , Berkeley, the Far East, and eventually right here on the central coast was enough to keep the audience interested, amused, informed, and wanting to listen far longer than the allotted two and a half hours. In addition to his talk, Bill brought his most recent collaborator Heath Proskin. 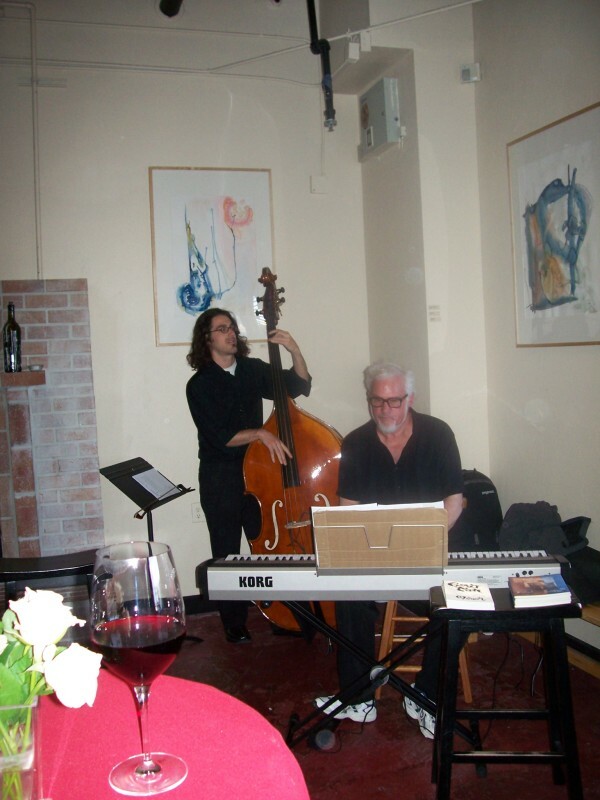 Heath is a wonderful jazz musician in his own right with a PhD in mathematics. They demonstrated their very creative latest endeavor of prose against a backdrop of Heath’s stand up bass, with a little keyboard (and some Cole Porter) mixed in here and there by Bill. Their demonstration was at times, witty, poignant, charming, and thoroughly entertaining. They definitely left the audience wanting more. 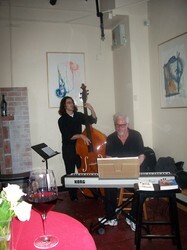 In addition to Bill’s wonderful talk and music, the atmosphere at Cava, also helped make this event a success. Wine bar owners, Cliff Covington and Zach Worthington have created a friendly, cozy, environment conducive to events such as this. In addition to offering a discount on their own appetizers and local wines, they invited participants to bring in (and have delivered) pizza from local restaurants. Starting next month, Caruso’s Tuscan Cuisine, right next door to Cava will be offering a 10% discount on their wonderful authentic Italian pizzas. The personal pizzas they make might be a bit easier to manage while listening to speakers in the future.